The Walking Dead Ep 1: All That Remains is the first episode in the second season of the adventure series by Telltale Games. 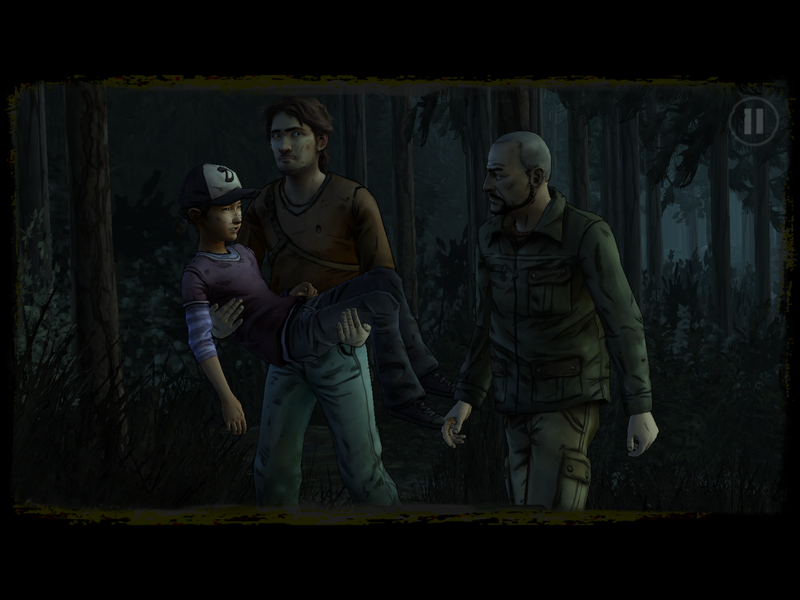 It picks up where season 1 left off with Clementine, Omid and Christa together and trying to survive. They come across a facility with public bathrooms and stop to get cleaned up with Clem going in one bathroom and Christa going in another. In a moment of letting her guard down, Clem leaves her gun on the sink while in one of the stalls and that proves to be critical as a woman comes in rummaging through her things and takes the gun. With no choice but to come out the stall and deal with the woman threatening her, things go from bad to worse when Omid sneaking into the bathroom startles the woman and results in her shooting him at point-blank range and killing him. A pregnant Christa runs in with her rifle, and when she sees Omid shot dead she doesn’t hesitate in killing the woman despite her apologies and pleas. 16 months later it’s just Clem and Christa around a campfire and apparently they haven’t been doing much talking. They haven’t discussed Lee, Omid, or even what happened to the baby. Christa just wants Clem to focus on her survival skills such as knowing how to start and maintain a campfire until they arrive in Wellington, where Christa believes it’ll be safer. And as if she was prescient, Christa is accosted by some strange men while looking for more firewood. And in the commotion Clem is able to get away but the two are separated and she has no idea what happened to Christa. And so it begins, Clem’s journey on her own. Has she learned enough from Lee and then Christa in order to survive, or will she be overwhelmed and soon become a victim? Now I thoroughly enjoyed season 1 and I felt the dynamic between Lee and Clem was the most consistent and strongest aspect of the season. And the death of Lee was an extremely heartfelt moment and didn’t feel force or manufactured. Of course I enjoyed the game play and for the most part they made it feel as if I was truly making life or death decisions in a zombie apocalypse, as well as giving an understanding of daily life. So to say that I had high hopes for season 2 would be an understatement. And it started off with a recap of the first season, and if you actually played season 1 and still have the saved game file you will see the choices you made in this recap. It was a necessary touch and also pulled me back in to the series and made me care about everything that happened again. I wasn’t big on Christa and Omid due to them being later characters in season 1 but I had enough to feel something towards them, and their connection to Clem was the main aspect of it. So despite the very questionable decisions that led to this fatal encounter (why did Christa and Clem use separate bathrooms, Omid stopped keeping a watch?) it still felt more genuine than manufactured. And more than that it was raising the stakes from the very beginning and reassuring me that the tone from the first season wouldn’t be lost or watered down. There were also some interesting choices that could be made at the campfire in terms of what to use to keep it going and I wonder how that will play out later. I’m glad Clem is actually older this time around (11) and considering the situations she would be placed in, and she’s the playable character, I didn’t think about that at all in a negative way. Of course that’s because I played season 1 so there was more of an understanding of her recent history and what she learned from Lee, however I don’t think it’ll be much different for those just starting now. The game play mechanics are very straightforward. I played on my iPad since that’s where my saved games are and the controls were solid. You drag your finger anywhere along the screen in the direction you want to move Clem and you can interact with items that are highlighted on the screen. Sometimes clicking on it leads to a direct action and other times it brings up a context menu where you can use an item from your inventory, interact with it or just look at it. There is still no direct way to access your inventory so you’ll know for sure when you can use an item or not. This makes the puzzles somewhat easy to solve since there’s always one solution that’s given to you, however the story and the action sequences ramp up the experience. And I don’t want to give any of it away but the action starts early and it’s intense. Clem is literally in for the fight of her life and even after this ordeal the danger isn’t over because the whole world has seemingly gone mad. The old adage, “don’t bite the hand that feeds you” is true here too. The action is controlled by quick time events where you either have to swipe in one direction quick enough, filling up a bar fast enough or hitting the right location on the screen in time. It really felt intense and enjoyable. This isn’t a completely solo adventure for Clem as events lead her to a new group that is very suspicious of her. And for the number of people introduced at one time Telltale does a great job of giving enough to at least differentiate between them for game play purposes. I understand their suspicions in a world where the zombie apocalypse brings out the worst in people but some of their animosity seemed exaggerated in terms of dealing with an 11-year-old, and one almost becomes a caricature of a stereotype. This does lead to the most interesting part of this episode and also highlights the possibilities with Clem in future episodes in terms of how you can choose to interact with the others. I liked Clem as a character in season 1 but this episode takes it to another level and wow, she has to do some incredible things to survive. If you were concerned that the brutality and graphic nature of certain aspects of the game would be watered down because Clem is the playable character then I can assure you that isn’t the case. And it’s not those around her but her actions, or rather actions you will have to perform as her. You truly have to fight for your survival. And you have to use your wits as well. 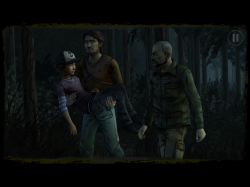 Telltale Games always does an excellent job of creating very interesting game play mechanics just through interactions with objects (or other people) because of what’s at stake, and when you get to the specific part that’s critical to her surviving another day you’ll understand completely. Life and death decisions regarding other characters are still present here although there is enough setup for the characters not involved in those life and death situations to make their potential storylines very intriguing. There isn’t another character as compelling as Lee so far but Clem holds her own as the star of this episode and this season. The Walking Dead Ep 1: All That Remains is a very solid start for this season and shows that Telltale Games is planning on making this season even better than the first one. The story line that ultimately leads Clem to another group is both gripping and exciting as the action sequences make sure you never forget the world this is taking place in. 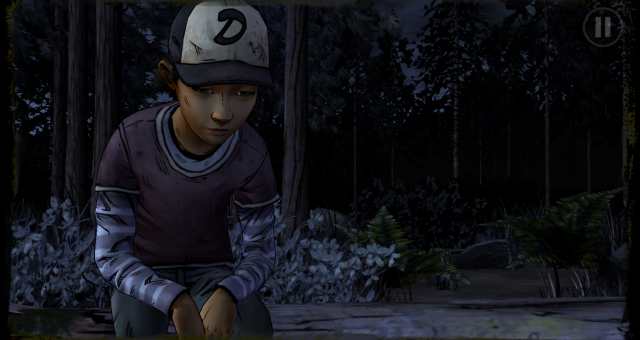 And with a scene that reminds Clementine of Lee’s last moments, the emotional impact of decisions and actions won’t be absent either. I did question some of the decision-making of the adults in this episode that constantly put Clem’s life in danger and even though I understand that those poor decisions led to interesting game play and exploring another side of Clem, I would like to see a little bit more common sense from them. And the hostility of one character towards her achieved caricature status and reaped of irony, so I’m hoping that is explained a little bit more as things come to light. The puzzles aren’t difficult however the real choices you’re faced with add another enjoyable aspect to the game play. Overall this episode made this season worth the wait and if you still haven’t tried this series yet I highly recommend it.